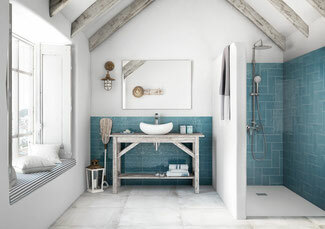 Porcelain floor tiles + ceramic wall tiles for a bright, refreshing, easy-to-clean bathroom design. Porcelain and ceramic tiles are our most popular products, and for good reason. We're answering the most common questions about ceramic and porcelain tiles! 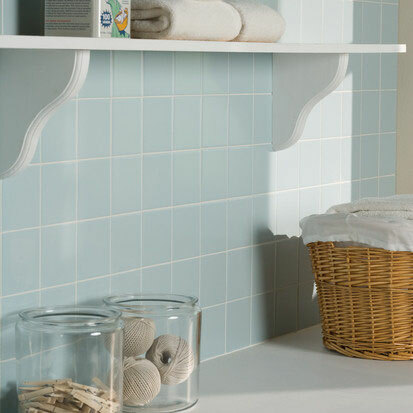 These 4.25x4.25" light blue ceramic tiles have a matte finish and help create a serene, seaside look in this laundry room. Short answer: Porcelains are denser, harder ceramics. Long answer: All porcelains are ceramics, but not all ceramics are porcelains. Porcelain and ceramic are essentially the same material: modified clay that is fired at very high temperatures (usually between 2100-2500°F). 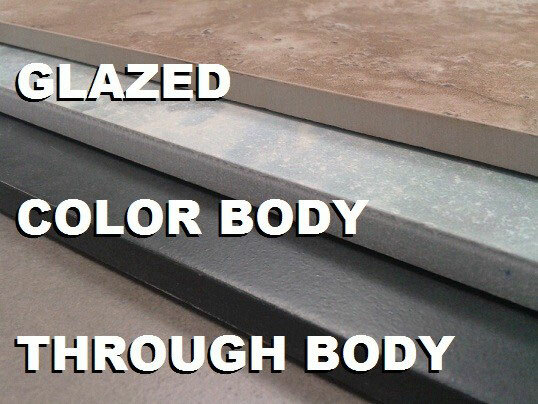 This clay can be colored, glazed, and shaped to the manufacturer’s desire to create a wide variety of looks and levels of durability. To determine whether the end product qualifies as a porcelain or as a ceramic, the tile is submerged in water for a period of time. If, when it’s removed, it has absorbed more than 0.5% of the water, it is a ceramic. If it’s absorbed less than 0.5%, it’s a porcelain. A low absorption rate means it is less porous, denser, and stronger. What are the benefits of ceramic over porcelain, and vice versa? Ceramics: Because they’re easier to produce, ceramics are generally less expensive than porcelains. Porcelains: Porcelain tiles are more durable and can be installed in more places than ceramics can. Also, there is a vastly greater selection of porcelain tiles than there is of ceramics. For example, we have an approximately 14 to 1 ratio of porcelain to ceramic tile on display in our showroom. Can ceramics be used on floors? 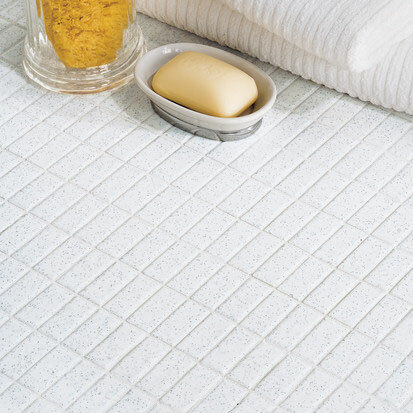 These unglazed ceramic mosaics are durable and highly slip resistant, ideal for bathroom, laundry room, or entryway floors. Short answer: That depends upon the ceramic. Long answer: The weakest (and most common) ceramic tiles are the glazed tiles that are commonly used on shower walls and some countertops; these are far too fragile for floors. However, there are floor-grade ceramics that are almost as durable as porcelains, and they are suitable for most residential floors and light traffic areas. Also, unglazed ceramic mosaics are excellent for high-traffic areas, as there’s no glaze to wear off the surface. 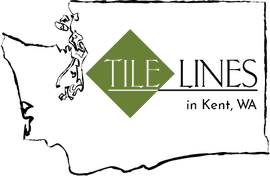 Ask us about specific tiles you're interested in and we'll tell you how well they'll hold up in your installation. Can glazed tiles be used on the floor? The Glazed tile has a gray clay body and a brown patterned glaze. The Color Body has a blue patterned glaze and a blue clay body. 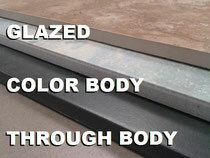 The Through Body has no glaze; you see the black clay body from top to bottom. Short answer: That depends upon the glazed tile. Long answer: There is nothing inherently inferior about glazed porcelain or glazed ceramic. However, there are different durability levels of both porcelains and ceramics, and their glazes also vary in durability. 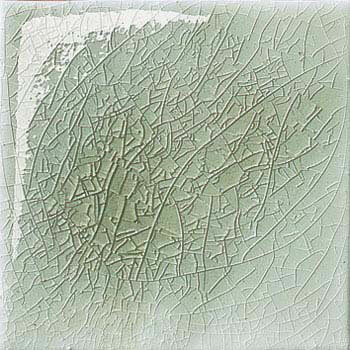 A tile's PEI rating indicates how durable the glaze is: a rating of 5 is the most durable and can be used in high-traffic commercial areas (such as airports and shopping malls), while a rating of 1 is the least durable and only recommended for use on interior walls or light-use countertops (such as bathroom countertops). Also consider what is below the glaze. If the glaze is significantly lighter or darker than the body of the tile, it will be very visible if the glaze wears off (which can take as long as twenty years in a residential setting). The clay body in a Color Body porcelain has been dyed to match the glaze so that if it does wear off, it will be very hard to notice. A Through Body porcelain often has no glaze, and the pattern/color on the top continues through the body of the tile. Do I need to seal either porcelain or ceramic? 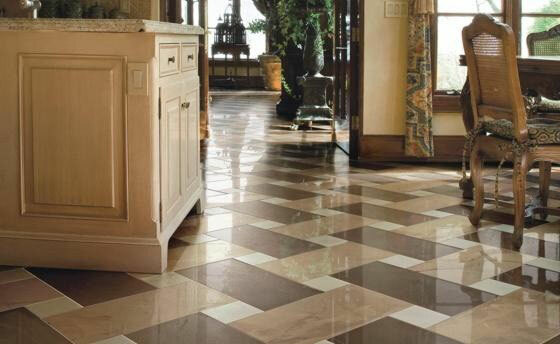 American tile manufacturer Crossville recommends sealing their polished Buenos Aires Mood tile. Porcelain: Some manufacturers recommend using a penetrating sealer on polished porcelains before grouting (the polishing process opens up micro pores in the surface), and some unglazed tiles are susceptible to staining. However most porcelains do not require sealing; check with your tile dealer to see if the product you're interested in requires sealing. Ceramic: If you are using a contrasting grout color with your glazed ceramic tiles (for example, white tiles with black grout) or if your ceramic has a crackle glaze, then you should seal your tiles before grouting. If you don’t, the pigments in your grout could settle into the tiny micro pores and/or cracks in the ceramic’s glaze and stain it. So what should I use in my installation? For vertical surfaces, such as shower walls or backsplashes, you can use either porcelains or ceramics. For low-traffic areas, such as bathroom floors, either floor-grade ceramics or porcelains will work. For high traffic areas, such as an entryway, hallway, or kitchen floors, porcelain will hold up better, but you can still use some high-quality, floor-grade ceramics. For outside areas exposed to the elements, we recommend a high quality porcelain (preferably Through-Body or Color-Body). Find one that's rated as frost-resistant. These high density porcelain tiles will survive the freeze/thaw that occurs in Pacific Northwest winters. Wow! In the end I got a blog from where I can really take useful information concerning my study and knowledge.